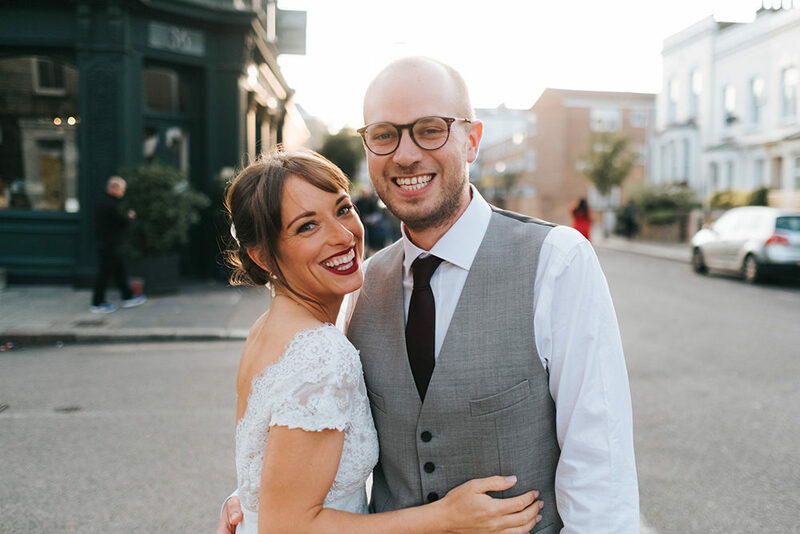 Louise & Oliver are one of the smiliest couples we’ve ever featured, but when you’ve got a lot to smile about it’s easy to be beaming all day. 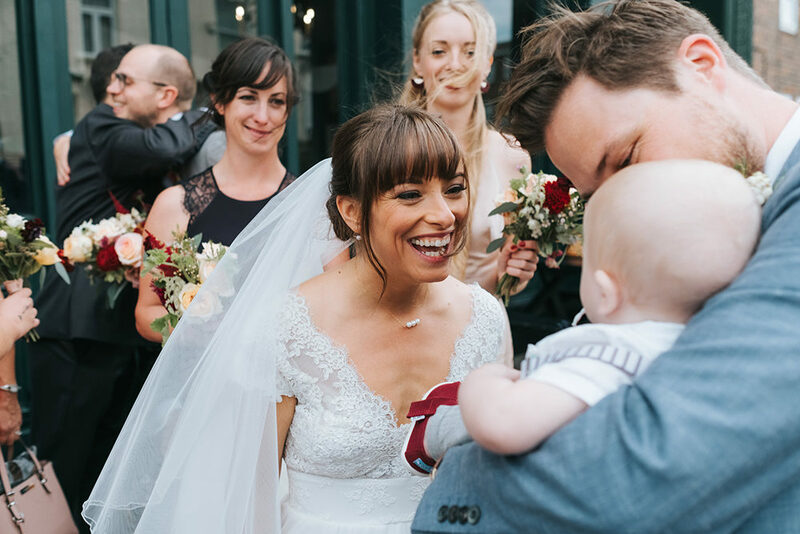 They share their laid back London wedding with their seven month old little boy Otis who is off the chart adorable, and the images captured by Miss Gen Photography of them as a family unit will make mouth a big ahhh. 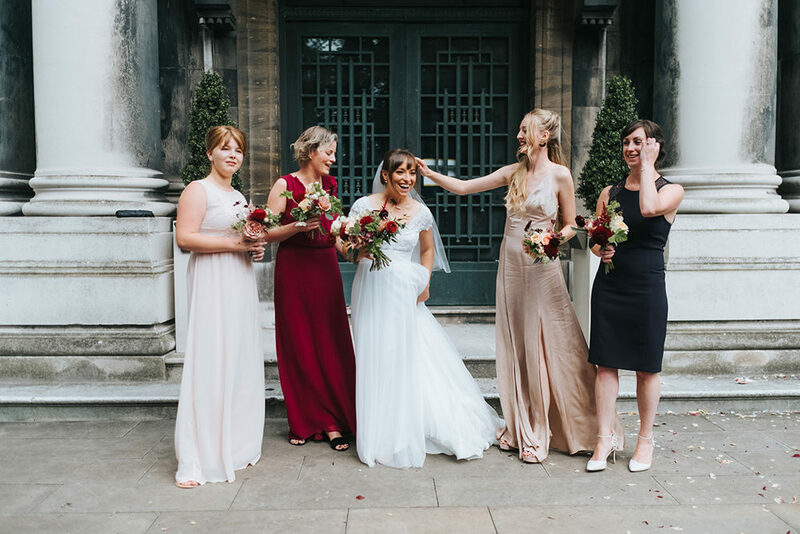 The fashion is fabulous, the detail on Louise’s Cymbeline gown is truly exquisite, the flowers by Bloom & Burn are breathtaking, and everyone looks like they are having the best time. 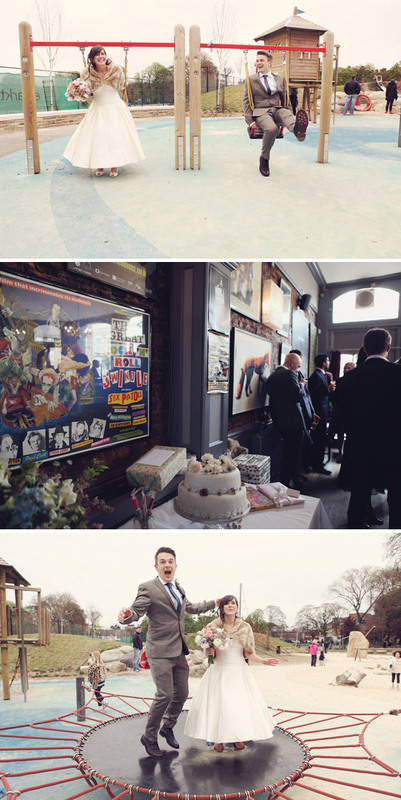 This is definitely a wedding to dive into and let the love and pretty wash over you. 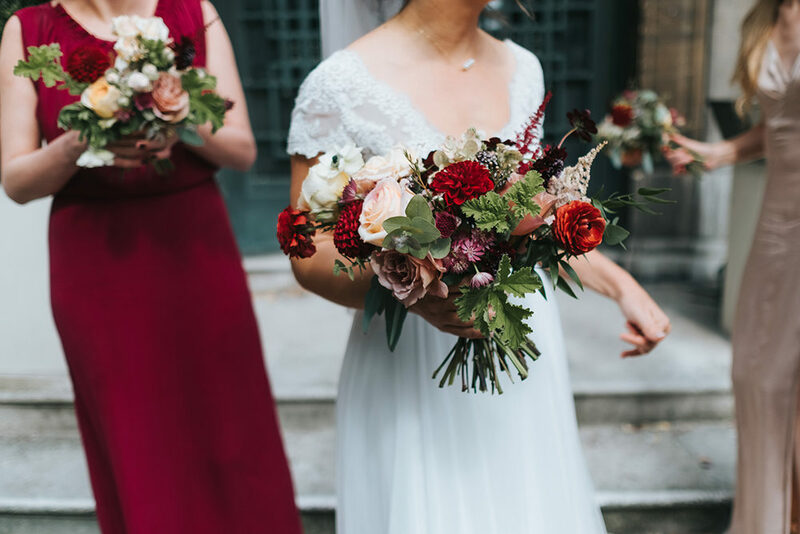 I’m not going to lie to you but if I had to choose a favourite wedding season then it would be by far and away that of Autumn. 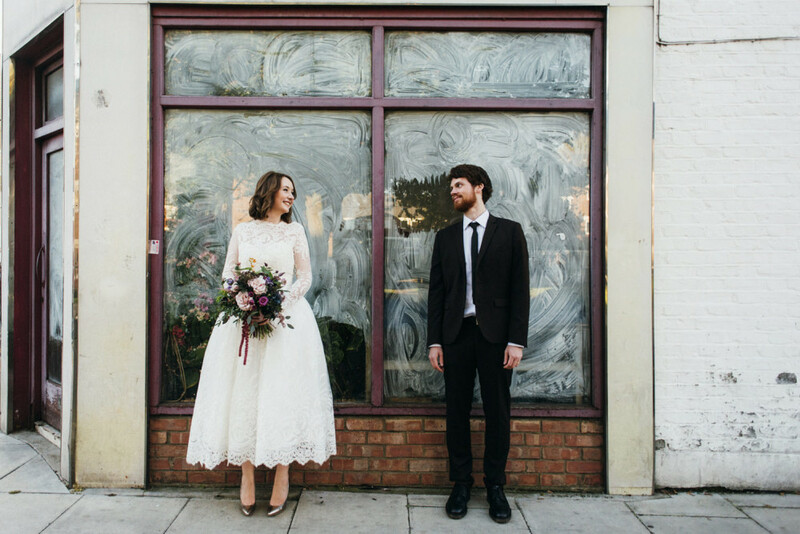 If you take a look at the delicious big day of Hannah and Joe then it’s easy to see why. 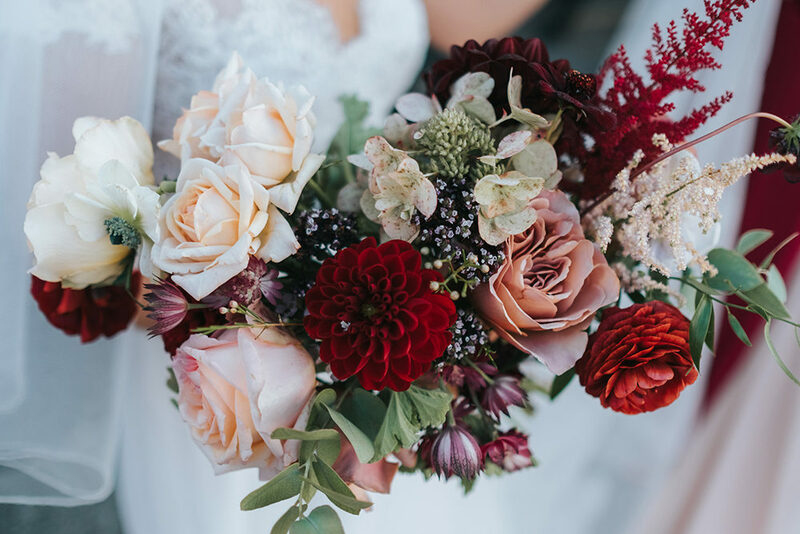 There are delicious posies of blooms in berry shades accompanied by bridesmaids in similar hues, seasonal comfort foods and that exquisite golden light that epitomises this time of year. Oh you’ll see exactly what I mean in the pair’s portrait images in the gallery below. 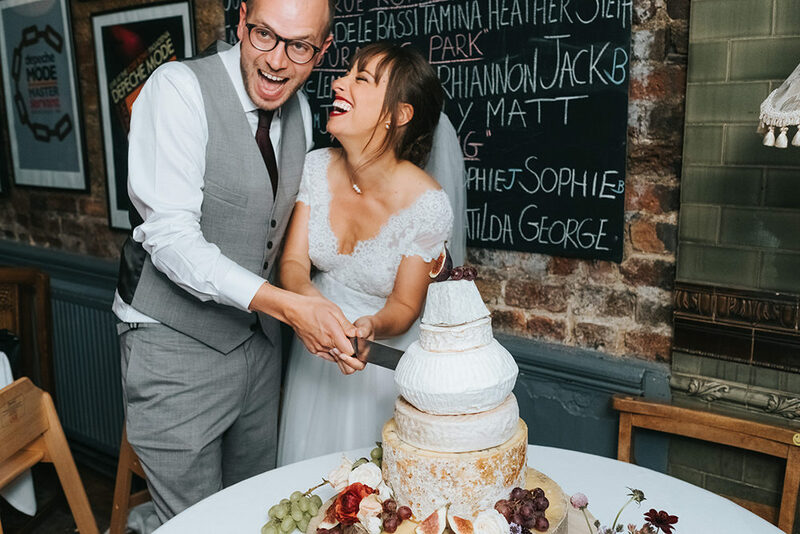 Oh and one last thing – don’t forget to check out Hannah and Joe’s cake topper…AWESOME. 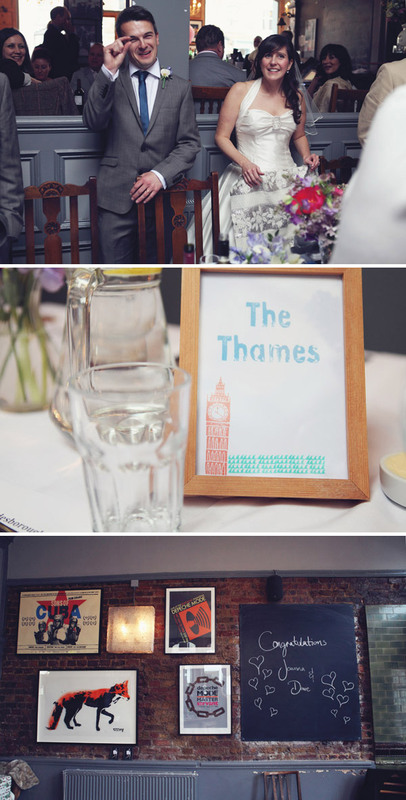 Danielle & Scott: The London Lovers. Hi friends! It feels like an age since my last post, but I have so enjoyed reading my fellow RMW real brides stories over the last month. They are such a lovely lot & I’m so looking forward to the next year with them! 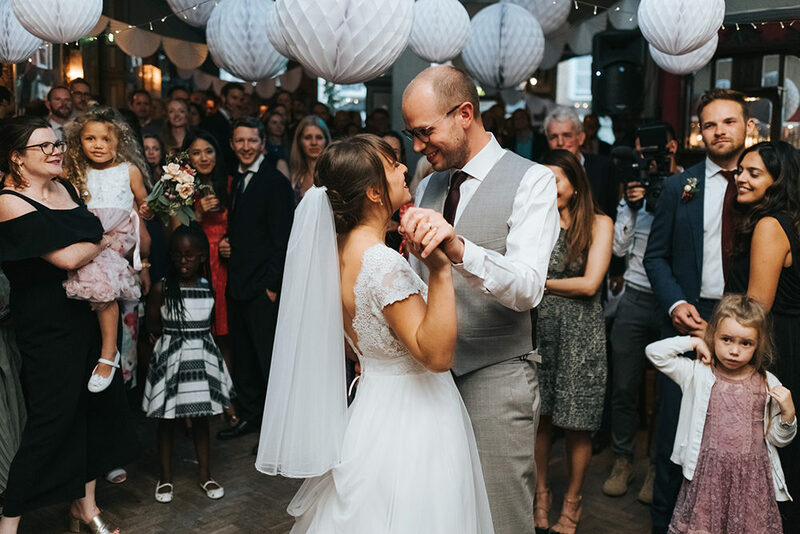 Today I’d like to share with you the ideas behind our wedding day, with a little bit of back story to help you understand why it’s going to be so perfect for us. Ever since we got engaged back in November, Scott & I have been discussing what our ideal wedding day would involve. Our biggest decision, Scotland or England, had been tackled and decided on very early on. Ever since moving almost 3 years ago, I’ve been fully in love with this city. Actually though, I loved it long before I lived here, I’ve known it for many years. When I was a little girl, my favourite person in the world, my aunty Gwen, lived here, so I visited often and it was always a magical, vibrant, full-of-life city to me. I used to tell my family that one day I would live here. Life normally tends to catch up on childhood dreams for most people (I still can’t believe I’m not the next Francine Pascal, aka the greatest author in the world known for Sweet Valley Kids/Twins/High/University!) but fate obviously had other ideas for me, so even though I thought I was settled in Edinburgh for good, I suddenly found myself moving to London and living out my childhood dreams at (the grand-old-past-it age of) 25. Joanna and Dave we married over the Easter weekend earlier this year. Dave is from Southend on Sea and Joanna is from New Zealand and they both now live in London. 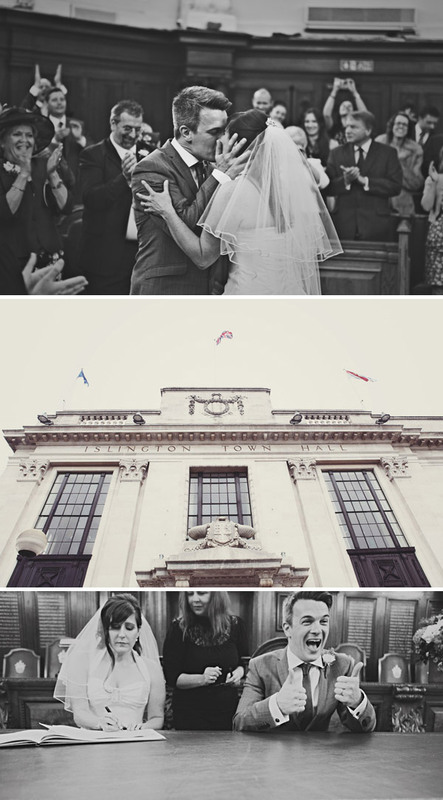 Their ceremony was at the beautiful 1920s building that is Islington Town Hall. 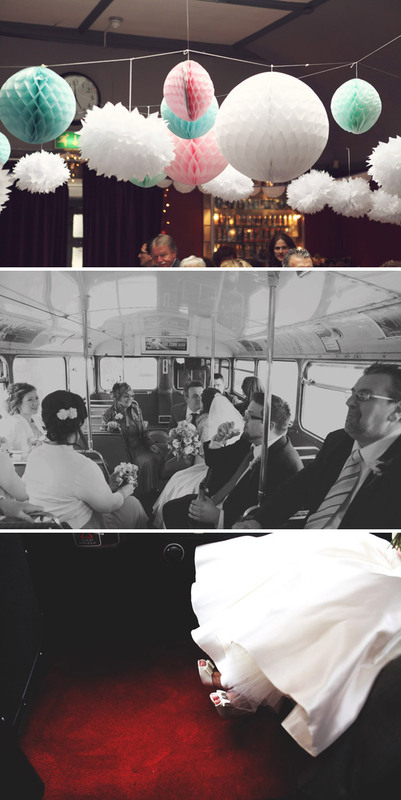 The guests were then whisked away to a reception at The Londesborough in Stoke Newington in a classic Routemaster bus. Aparently there was a substantial amount of New Zealand bubbly on board to get everyone in the party spirit. Photography today is by Joanna Millington. My dress came from the lovely ladies at Morgan Davies in Islington. 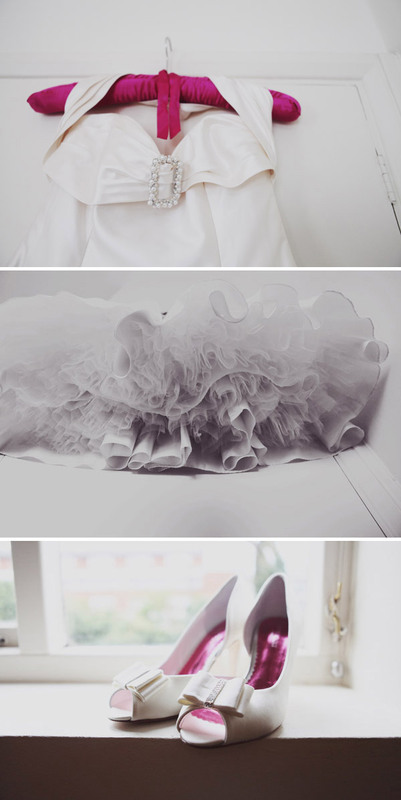 It was important to me to have a dress by a British designer and I was delighted when I found ‘Heaven’ by Blue Bridal. When I tried it on, the pure silk fabric felt so luxurious and it fitted perfectly. I’d wanted a 1950s style dress from the start and was pretty sure that I wanted a ‘tea length’ dress. Being on the shorter side I thought it might be an idea to show off a bit of ankle! 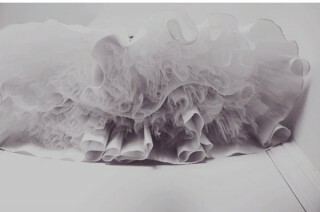 It’s such a buzz to twirl a full skirt with petticoats! One of the most special pieces of jewellery was a silver filigree bracelet belonging to my late mum. My dad brought it over from New Zealand for me and it was a great feeling knowing I had a part of her with me. I’d been on the lookout for earrings for months, so I was delighted when I saw a beautiful pair that matched my engagement ring in a shop in Courmeyer, Italy. A very surprising find while on a ski holiday! Accessories are my weakness… I couldn’t have just one pair of shoes! 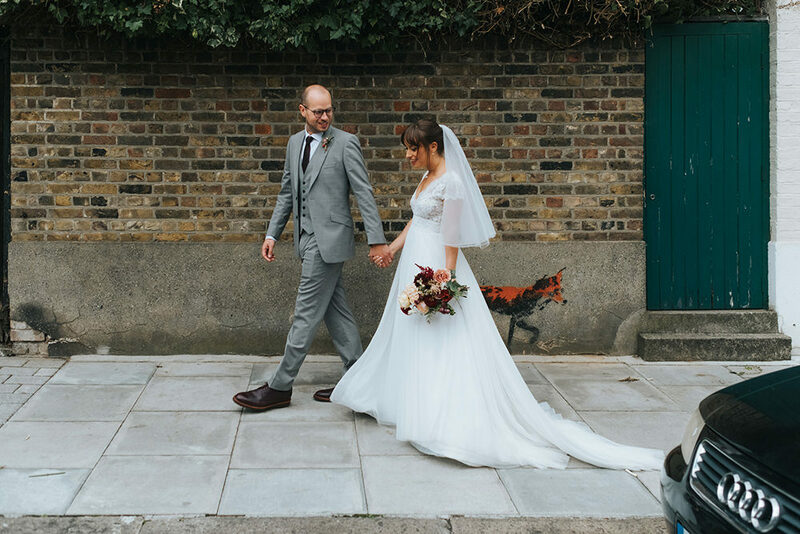 For the ceremony I wore a pair of ivory silk Filippa Scott peeptoes, which went perfectly with the dress. I love to dance, so later in the evening the party girl was unleashed and I slipped into a pair of gold glitter Kurt Geiger peeptoes. I can’t wait to wear them again at another party, they are made for disco! Jaydean Allen was super at suggesting styles and advising on what would work with my hair and for the bridesmaids. To show off the dress I wanted a half-up do and went for a bit of lift at the front, then loose wavy curls at the back. I often wear hair combs, it is almost my signature look, so I really wanted to add a comb to my do. 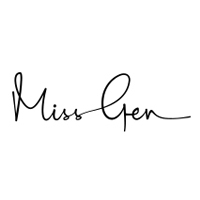 After trawling lots of vintage shops, I found the perfect one with a vintage vibe at Glitzy Secrets. Our make-up was created by Jane Weston, who did a fantastic job making me look like I’d had a full eight hours sleep! Jane had great ideas about lipstick and colours and even met me at Bobbi Brown to help choose a lipstick colour. 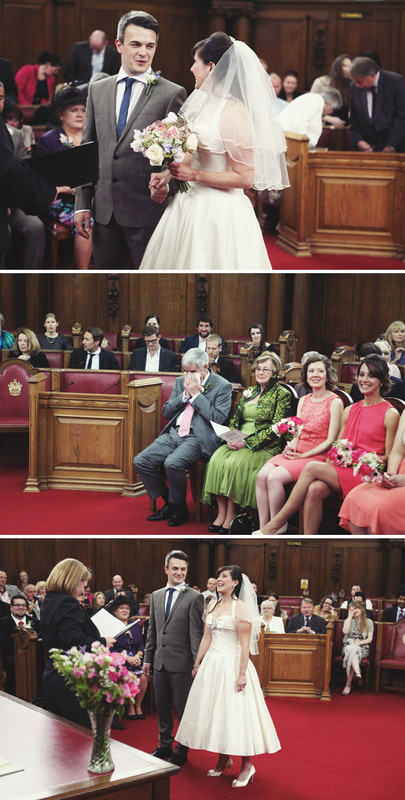 When I saw my bridesmaids all dressed and done up, it almost made me cry – not good for my own mascara! Our flowers were a real mix, roses, rununcullas, tulips, clover and so many varieties I can’t name! 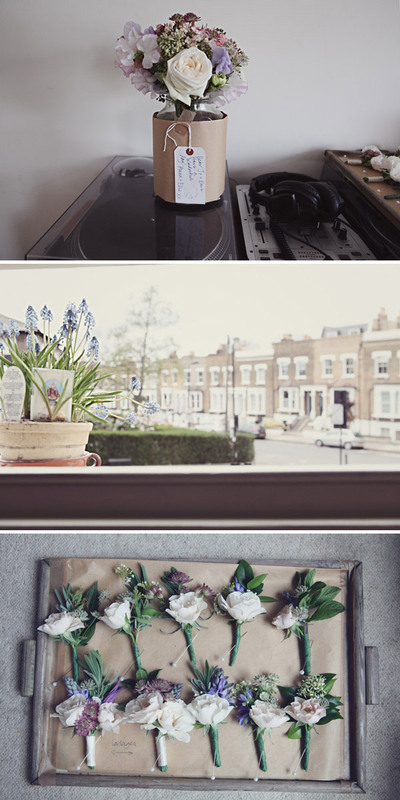 I saw the work of The Flower Appreciation Society and loved their style from the start. Ellie and Anna add lots of foliage and have wonderful country garden look. I went a bit mad and even sent them a ‘mood board’ of ideas and colours, but I left the selection of the flowers to Ellie and she captured the look perfectly. 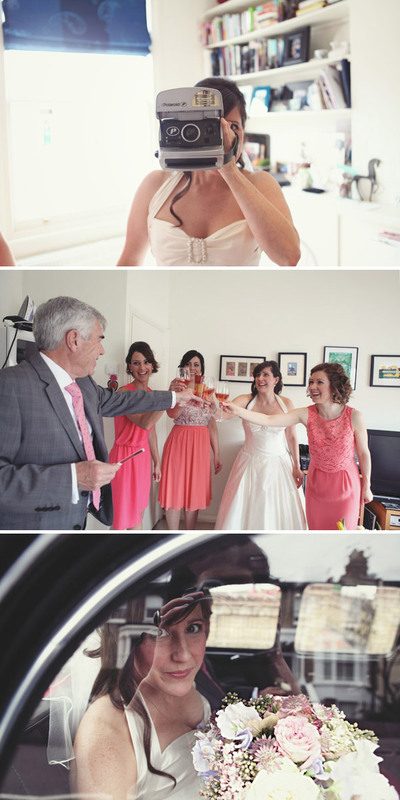 After a few false starts on the colour theme, I decided on a coral colour for the Bridesmaids. I didn’t want an identical look, so left the dress selection to the ladies. Our one stipulation was no strapless prom dresses! The search produced dresses from Oasis and Warehouse and the girls looked stunning. 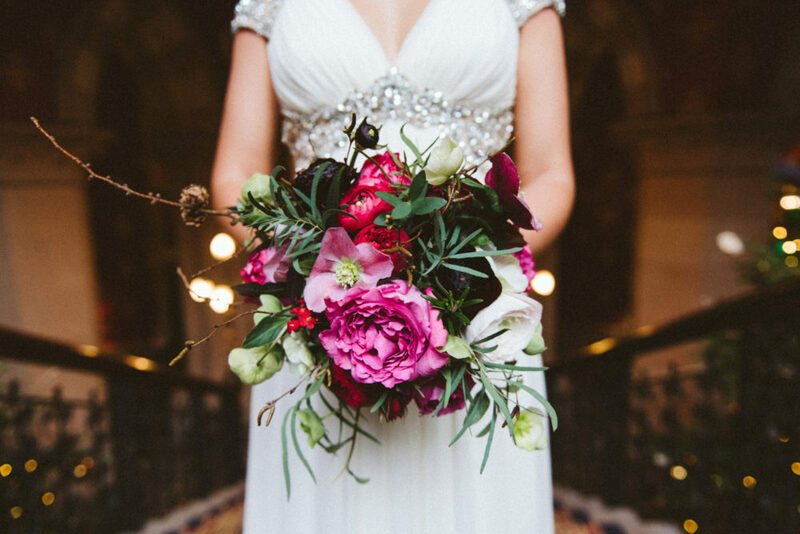 Their bouquets contained bright coral anemones which brought the colour to life. If only shopping for a wedding dress was as easy! Dave and his best man Rob went out one Saturday and came back with suits from Ben Sherman. Dave thought since he wasn’t able to see my dress, that he would leave his suit as a surprise too. I couldn’t bear this and asked one of my Bridesmaids, Bryony to ‘inspect’ it. Luckily it passed the test and I am pleased to say Dave looked amazing and without any of my style input! Honestly, my heart skipped a beat when I saw him turn around as I walked into the ceremony. Our photographer was one of the first things we decided on. I’d seen Joanna Millington’s work and loved the way she captured details and people. Jo really tells the story of a wedding and when I look at my photos now I get transported right back. On the day, Jo just fitted in like one of my friends, lots of laughs and a real calming influence in some of the more anxious moments! Jo does more than just ‘shoot’ the day, she really concentrates on spotting little details that make up a bigger picture. Our cake was truly jet set! My stepmother, Jillian made the amazing fruitcake bottom layer in New Zealand and brought it over the week before the wedding. Jillian even contacted Defra (the UK food agency) to get a permit to bring the cake into the UK in her hand luggage! That’s dedication we are so grateful for! The top layer was an amazing chocolate mud cake. Jillian iced it all here and we decorated it with fresh flowers to match the bouquets and two little porcelain birds that I made myself at my pottery studio. DJ Neville the Devil was our DJ of choice. 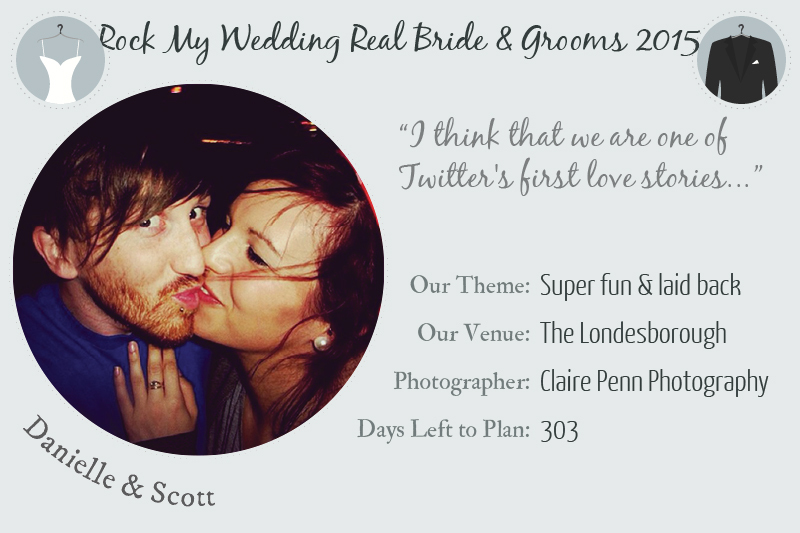 On our RSVPs we asked everyone to fill in: “the song that gets me on the dance floor is…..”. We compiled all the answers (minus some Swedish death metal requested as a joke) and gave them to Neville. This meant that everyone, including the older generation had funk, soul and 80s tunes to dance to. Luckily most of our guests had good taste! Neville is an interactive DJ and got involved on the dance floor. Everyone loved it and I didn’t stop dancing all evening! We also had a photo-booth section with all the crazy costumes we had collected over the years – the results were hilarious! Dave is the music brains in our partnership. He told me many year ago that ‘Baby let me take you’ by the Detroit Emeralds would be his first dance song. When we were planning the wedding I reminded him of that and nothing else came close! I’d always wanted a few handmade touches at my wedding, so I made lots of vases in my pottery studio that we used to decorate some of the side tables. At the end of the night I told all the ladies to take one home with the flowers inside. 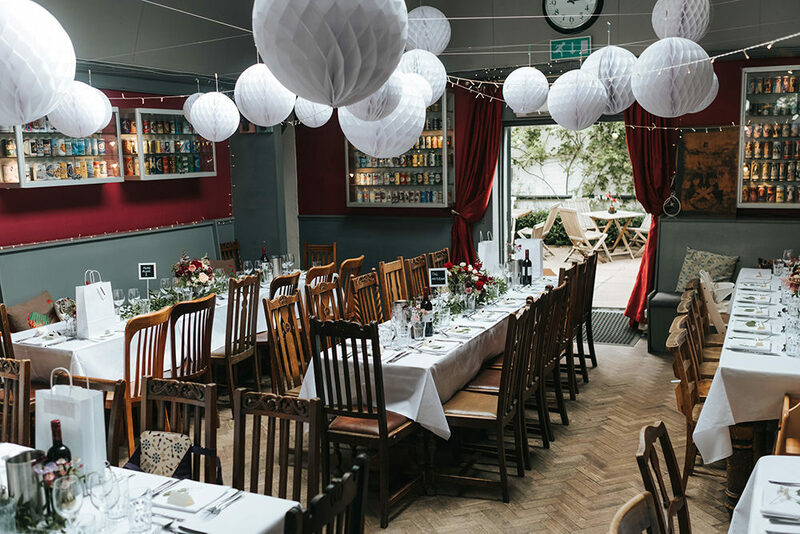 The fantastic team at The Londesborough did the hard part of putting up the 25 white pom poms, 8 pink honeycomb ball and 20 meters of handmade doilies bunting. 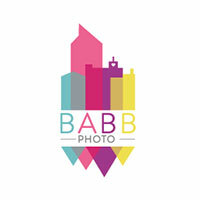 It looked amazing and really transformed the venue into a celebration. One part of the day I will always treasure is the special moments I shared with my Dad on the way to the ceremony. In the lead up to the wedding lots of people said “remember it is your day”, but it wasn’t until that moment in the car with my Dad that I really embraced that feeling. We put lots of effort into heartfelt handmade touches, from the invitations, to the decoration, but it wouldn’t have been half as successful without the help of friends and family. I will be eternally grateful to my brother who repeatedly burnt his fingers while ironing doilies bunting! Dave’s impromptu serenade to the Kool & the Gang song “Joanna” has to be up there with priceless memories! It’s an empowering feeling expressing your love in front of family and friends, so make it as personal as possible. Don’t buy into other people’s expectations, stay true to your vision. I love the fact that Stepmum Jill phoned up DEFRA to make sure she could get a wedding cake through customs… That has to be one of the most random stories to ever grace these polka dotted pages! I really do dig the chilled and relaxed feel to this cool big city celebration… but I also love those little bits of fun and excitement. 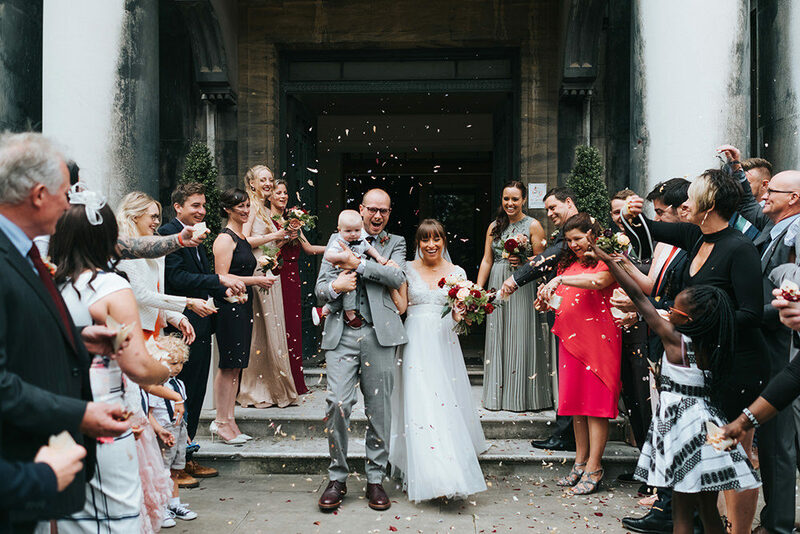 The celebratory spin in the hallway of Islington Town Hall is priceless and the couple shoots on the adventure playground can not fail to bring a smile to your face. 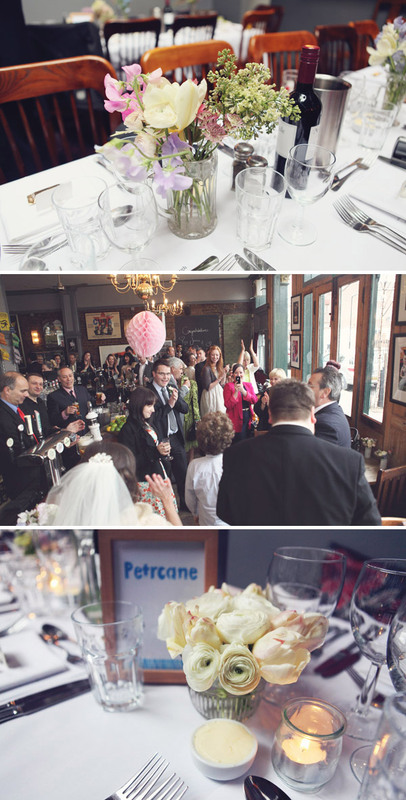 Thanks to Joanna and Dave for sharing their big day with us.